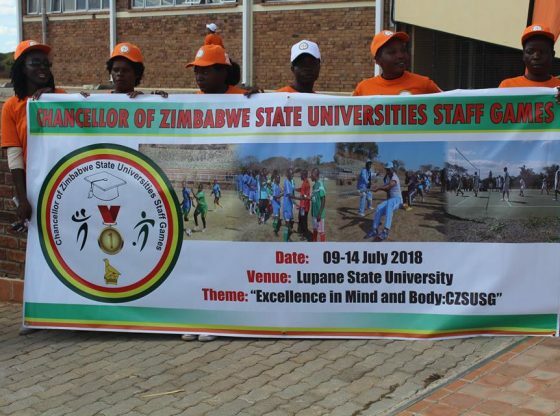 The Chancellor of Zimbabwe State Universities Staff Games have kicked off in Lupane with a total of eleven academic state institutions fielding a total of 700 athletes. The 2018 edition of the games, which are being hosted by Lupane State University, features various sporting disciplines, which include soccer; netball, athletics, basketball and volleyball among others and will run for the next five days. The Midlands State University team is bubbling with confidence and hopes to take back home several medals to prove its sporting prowess. In his welcome remarks, Lupane State University, Acting Pro Vice-Chancellor Mr Canaan Mpala, told athletes to continue taking sports seriously as they have numerous benefits, which contribute to the wellness of body in addition to improving productivity in the workplace. ‘Sports play a major contribution in reducing stress levels. Many have stress related issues but as you play sport, you shall realize that one is able to distress. Through sports several skills are learnt including team work, confidence and discipline, and we can therefore transfer those skills to the core business of our universities,’ he said. Soon after the launch of the games it was time to get down to business with teams battling for championship in the Tug of War. Team MSU is expected to excel in several disciplines given its past record in previous sporting events. The Chancellor of Zimbabwe State Universities Staff Games are hosted on a rotation on an annual basis across the country`s ten provinces.